Google Developer Group chapters are organised by locals around coding with Google products and APIs. I reached out to the organisers of the "GDG Port-of-Spain Launch" to get some words and photos from them for this blog post. Nicholas Mendez is one of the organisers and he responded with these words. Google Developer Group (GDG) is an international community of professionals within the software development industry supported and recognised by Google. Trinidad & Tobago's first local chapter, GDG Port-of-Spain, was launched on Thursday 23rd August 2018, 7:00 pm at Trincargo Intl. Borde Street. GDG POS seeks to improve the prominence of local software development and change attitudes towards it by providing events for enthusiasts and professionals to learn, experiment and explore in various cutting edge technological areas such as mobile, web, AI, VR, AR and Cloud Computing. Planning has already begun for our next event as the GDG platform has entered the DevFest season. 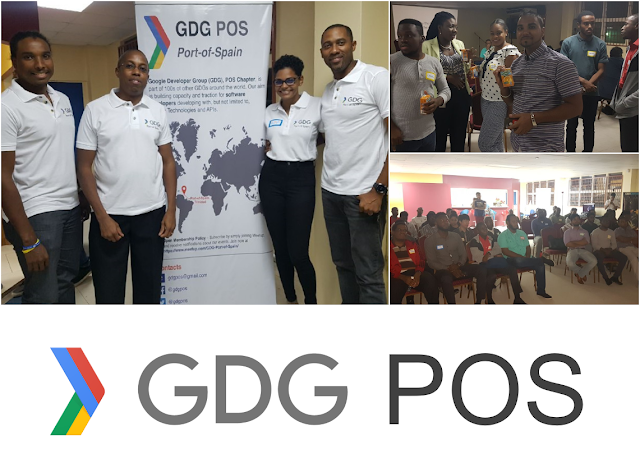 Persons interested in attending or speaking at future events can visit the GDG POS meetup page at https://www.meetup.com/GDG-Port-of-Spain/ or follow them on facebook, instagram or twitter.